I made this gift card holder using My Creative Time's gift card die. The sentiment is also from MCT. The cake is from Birthday Cakes, added yellow stickles for the flames, and some metallic stick-ons. You'll have one week to create your card, layout or altered project using a dessert on your project. 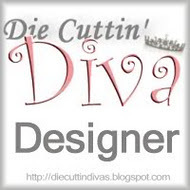 Please be sure to use a die-cut and link your post back to the Die Cuttin' Divas blog site. And check out the other Divas' projects for this week. Thanks for stopping by; your comments are appreciated! So cute, love that gift card die!! What a fabulous gift card holder! Love the beautiful colors! Have a great day. super adorable! Love this idea for a birthday gift!!! Awesome gift card holder Pat! I love the confetti lookin' cake and the fun papers! Fabulous job! Don't ya just love this die?